Shaken and Stirred is a carefully curated collection of nearly 200 easy, essential, delicious craft cocktails to make at home. Each recipe is accompanied by a tutorial video from Small Screen. Moreover, you can input your ingredient inventory and the app will show you which drinks you can make! This is the ideal cocktail app for absolute beginners. However, it’s awfully handy for experienced drink-mixers, too: while our other acclaimed recipe apps delve deeply into particular mixological themes, this one places a cross-section of popular, simple, proven recipes close at hand for quick reference. Important: all the recipes included in this app are available for free on the web. 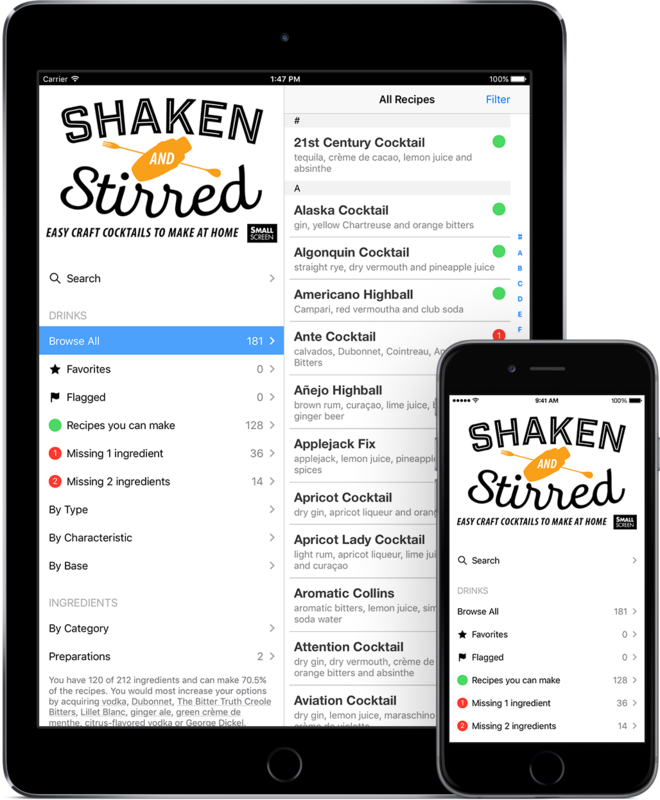 What this product offers is a native, interactive recipe database with search/filtration, built-in ingredient info, and an ingredient inventory feature that helps you identify the drinks you can make with the ingredients you have on hand. An ideal gift for any iPhone/iPad user interested in cocktails!